Ever taken a selfie on your birthday? Well, that’s just what the Mars Rover Opportunity did to celebrate its 5000th “sol” (martian day) on Mars. This doesn’t sound like much, but 5000 sols is about 14 years – not bad for a rover that was only expected to last about 3 months! 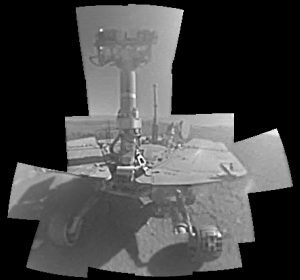 The selfie – the first one Opportunity has ever taken – was thought up and coordinated by Doug Ellison, who has been involved with Opportunity (initially as an amateur, now at NASA JPL) since it landed way back in January 2004. Who better to speak to to find out what this plucky little rover has been up to for the last 5000 sols? An extended edition of original broadcasts on 28th February 2018 as part of Pythagoras’ Trousers on Radio Cardiff. Don’t forget you can now subscribe to the podcast. For an archive of Pythagorean Astronomy, visit pythagastro.uk. Add our podcast feed to your favourite podcast service. Download the Podcast Republic Android app and search for "Pythagorean Astronomy"